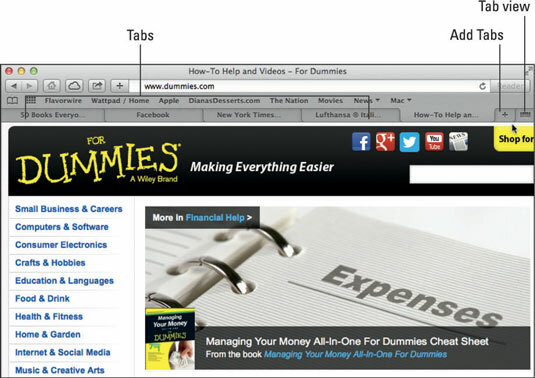 Mac’s Web browser, Safari, can manage multiple tabs when browsing. When you open multiple tabbed windows, as shown, you can rearrange how they’re ordered, close them, or save a group of tabs as a bookmark that you can reopen all at once with a single click of your mouse or add them to your Reading List. Tabbed browsing lets you juggle multiple web pages inside a single window. Add a new tab. Press Command+T or click the plus sign at the far right of the Tab bar. Switch from tab to tab. Press Command+Shift+→ or Command+Shift+<–. Close a tab. Move your mouse over the tab and click the X that appears or press Command+W, although that will close the Safari window if you have only one tab open. Rearrange the order of your tabs. Drag and drop a tab to the left or right of another tab. Move a tab to a new window. Drag it below the Tab bar and then let go of your mouse button, or right-click a tab and choose Move Tab to New Window. Save every currently loaded tabbed window as a bookmark. Right-click any tab (or click the Bookmarks menu) and choose Add Bookmark for These Tabs. Save the articles of every currently loaded tabbed window in the Reading List. Right-click any tab (or click the Bookmarks menu) and choose Add These Tabs to Reading List. Merge a bunch of open web page windows into a single web page with tabs for each window. Choose Windows→Merge All Windows. View tabs that get shoved off the row of visible tabs when you’ve opened too many tabs to display them all. Click the double right-pointing arrows on the rightmost tab. Open a contextual menu that displays all the tab options. Right-click a tab.